I really hate my big pores around my cheek. It's sooo annoying! And it looks really visible if I wear shimmer blush or powder ;;;;w;;;;. I was looking for a skin care to help smaller my pores (I know it's impossible) but at least it can look less visible. Thanks to Lovely Pinky who kindly sent me this Toner for try. Easily open and can protect the bottle inside so it comes without scratch. Made from a plastic, thin and not heavy. I really love the soft blue marine color, it gives a refreshing feeling! 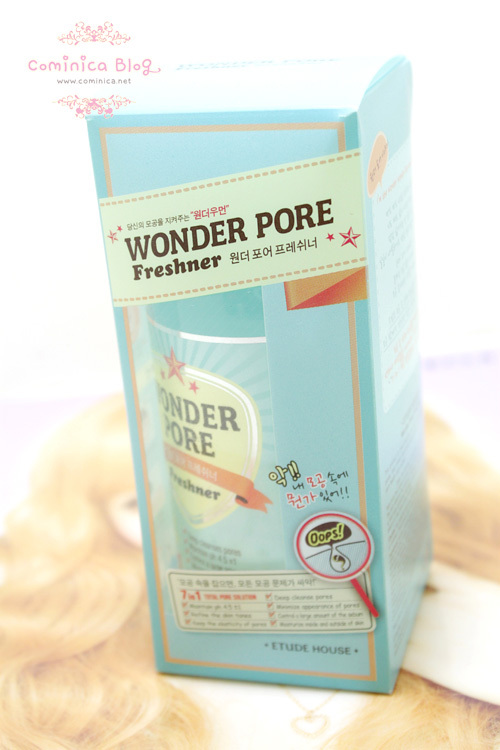 The Wonder Pore logo is also super cute! I got the one in 250 ml. Water, Chrysanthellum Indicum Extract, Alcohol Denat, Glycerin, Butylene Glycol, Glycereth-26 Betaine, Sea WAter, PEG-60 Hydrogenated CAstor Oil, Dosium Hyaluronate, Hydrolyzed Hyaluronic Acid, Citrus Medica Limonum (Lemon) Fruit Extract, Cycmbopogon Schoenanthus Extract, Oryza Sativa (Rice) Bran Extract, Prunus Mume Fruit Water, Uncaria Gambir Extract, Nelumba Nucifera Flower Extract, Cinnamomum Zeylanicum Bark Extract, Sanguisorba Officinalis Root Extract, Pelargonium Graveolens Extract, Taraxacum Officinale (Dandelion) Leaf Extract, Chrysanthemum Morifolium Flower Extract, Chamaecyparais Obtusa Water, Pulsatilla Koreana Extractm Dosdium EDTA, Phenoxyethanol, Caprylyl Glycol, Ethylglycerin, 1,2-Hexanediol. Normal and healthy skin should have ph around 4.5 to 5.5. More higher ph can cause acne to skin. 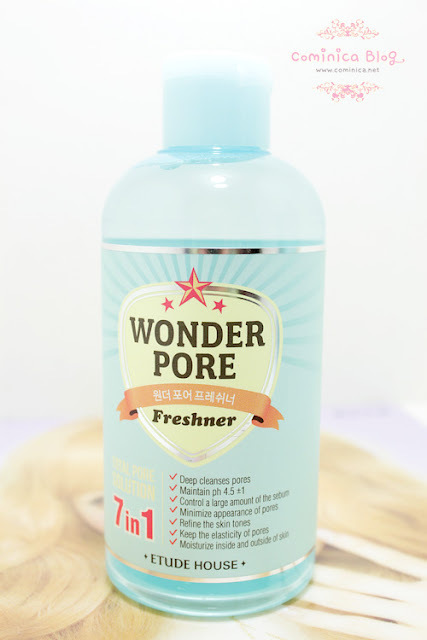 I feel my skin is rarely has acne now after use this toner for a while. My cheek area which has big pores is always more oily than other area on my face. And after use this toner for about 3-4 hours my skin is look less oily. I love how it can control sebum but I hope it last forever hahahahha. Hmm my pores are still so obvious, but I feel it look less visible after apply the toner. Sounds good, I might give this a try my pores are horrible! pertanyaan bodoh sih tapi sbenernya toner ini dipake setelah cuci muka ato sebelum? 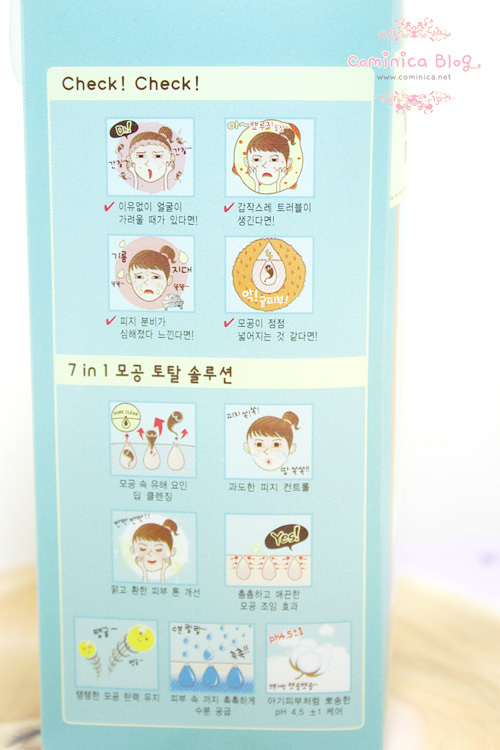 I love Etude House products' packaging. So adorable! Wah, ada alchohol. Bikin kering ga dikulit?? hey comi,ini aku via yang kita ketemu di luxola itu hehe *mav oot*,btw cocok buat kulit yang kering gak comi ? saya ditanyain macam macam sama lovely pinky. bisa dibantu ga? os mana lagi yg jual kaya lovely pinky cuma responnya lebih cepat dan ramah. Maaf ya kalo kamu merasa ga nyaman disana :( , ak uda kasih tau ke dia kok. I so want to try this !!! zatura jualan sama juga ya? ada whatsapp /pin bb zatura ga? Minta kontak lovelypink dong sis..